I love soup — it’s no secret. This simple, nutritious and endlessly versatile dish is a staple in my diet as well as in Ayurvedic cooking as a whole. That’s in large part because it can help you stay healthy, as well as help you get better when you find yourself unwell. There’s a reason your mum force-fed you chicken soup at the first signs of the sniffles! But just because soup is often associated with winter doesn’t mean it’s only good for the colder months — this one-pot wonder has so many benefits for our bodies all year round. Let’s start from the beginning, shall we? Soup has been around pretty much ever since humans first began cooking their food in pots and can be traced back to 20,000 BC. Can you imagine how many sorts of soup must have been invented by now?? Over thousands of years, broths, soups and stews have fed communities, because they are easy to cook, hydrating, easy to digest and make a small amount of food go far. 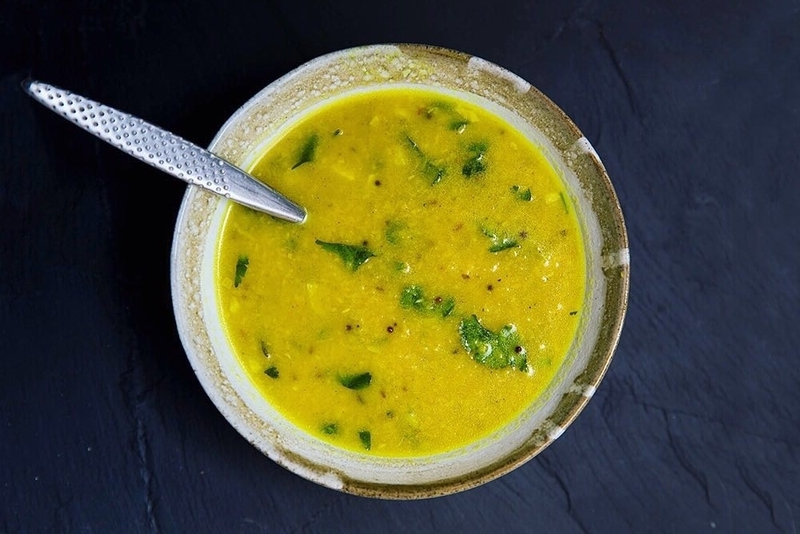 The Ayurvedic tradition fully embraces the soup lifestyle for the reasons above, with massive emphasis on the fact that it’s so easy to digest. All the ingredients have time to cook together and mingle in the pot, helping even the most hard-to-digest ingredient pairings (or bad food combinations) lose some of their worse properties before they even hit our bellies, making the soup all the more friendly for us when we finally introduce it to our stomach. It’s well cooked, so all the collagen walls in the veg are broken down, allowing us to access everything. By osmosis, nutrients are extracted from the bones via the long process of simmering. Finally, piping hot soup is great for keeping Agni going. As for treating illness, even Western doctors have been recommending soup for centuries. Chicken soup is particularly efficient because of the protein from the meat and antioxidants from the vegetables, but most soups have plenty of nutritional benefits — so don’t worry if you’re a vegetarian! 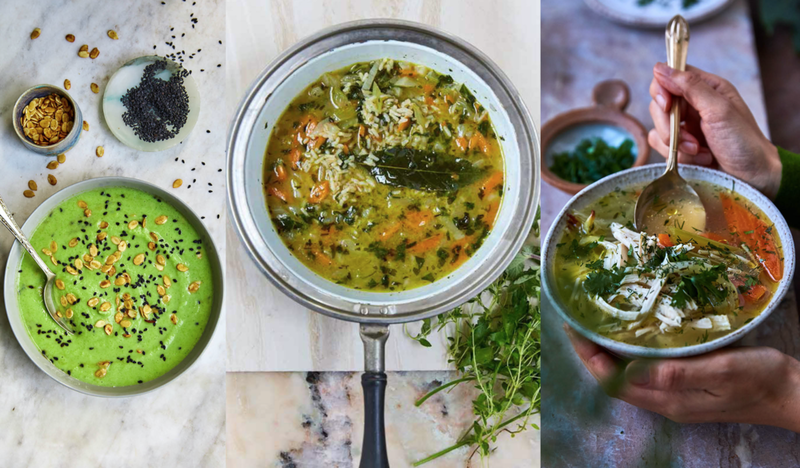 In fact, even though I’ll always have a sweet spot for chicken soup, there are thousands of tasty soups you can make according to your personal preference and adapting for your dosha — or just using up whatever’s in the fridge! From pozole to pho, there truly is something for everyone. As a rule of thumb, think thicker, more oily, well cooked, more root veggies to tame Vata; fresher, more cooling, more protein for Pitta; lighter, greener, spicier and quite thick for Kapha. Convinced yet? Right, let’s get cooking, then! If you have East by West, you’ll find many more of my all-time fav soup recipes — here’s a sample! My book, East by West, is available now — and brimming with yummy soup recipes!